Posted on June 23, 2015 . Sharing information trough infographics is an effective way to have a lot of information in a compact space. 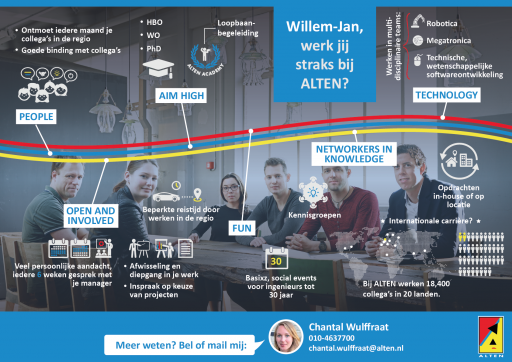 The recruitment staff at Alten was looking for such a thing to communicate what’s to know on working at Alten. In almost any workplace, the word that as a designer you can create visuals travels fast. Your colleagues will find the way to your desk easily. So I got asked to create an infographic for recruitment to have a medium that can be shared with applicants. 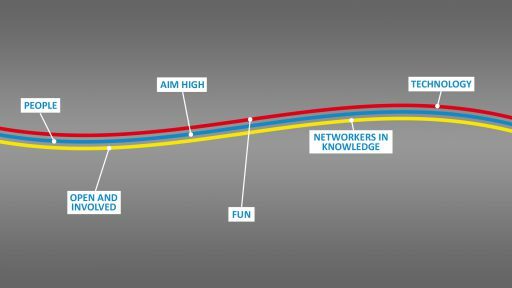 Alten relates strongly to its six core values: people, open and involved, aim high, fun, networkers in knowledge and technology. So it’s was clear that they had to be the base of the design. All other information should be supporting to it. One of the desires was to have it personalised per applicant and per recruiter. Therefore I transferred the design to a PowerPoint file that the colleagues from recruitment easily could edit and save as an image. After some revisions having comments going back and forth, I came up with the following result.